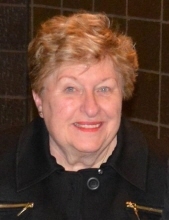 Leona K. Winner, Age 76. February 7, 2019 of Livonia. Beloved wife of the late Gene. Loving mother of Michaelle (Ron) Kwasniewicz and Wendy (Tim) Breen. Dear grandmother of Dillon, Andrea, Connor and Alexis. Sister of Jesse(Linda) Halstead and Rosemary (Louie) Miller. Visitation Friday, February 15 at 4-9 PM and Funeral Service, Saturday, February 16 at 11 AM at R.G. & G.R. Harris Funeral Home, 15451 Farmington Road, Livonia. In Lieu of flowers please donate to the Breast Cancer Foundation. She was dearly loved by all who knew her and will truly be missed. Please share a memory of Leona on her tribute wall. To send flowers or a remembrance gift to the family of Leona K. Winner, please visit our Tribute Store. 35667 W. Eight Mile Rd. "Email Address" would like to share the life celebration of Leona K. Winner. Click on the "link" to go to share a favorite memory or leave a condolence message for the family.